This lesson addresses the flying camel spin. There are three features/difficult variations for the flying camel they are camel up, camel side, and camel forward. Yo will see the skater demonstrate the 3 features and you will hear Paige discuss if these features are done correctly to achieve the levels. Paige discusses the 8 rotation feature as well and counts the spin helping you see and hear when to start counting. 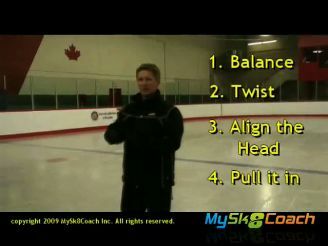 You must start counting after the skater stops moving and hits the position. In this 3 minute 49 second information session you will also hear a critique on the camel up. The shoulders are not really facing up to the ceiling and Paige talks about how to rotate so you achieve this feature. Categories: Spins, Camel, Camel Side, Camel Forward, Camel Up, Difficult Features, Flying Product Coach: Paige Aistrop. Product Skill Level: Intermediate, Advanced. Product Lesson Type: Private, Positions, Tips, Technique. Be the first to review “Flying Camel Levels Features” Click here to cancel reply.